Performance waterfall charts map out every piece of content on a web page and organize content by when it loads and how long it takes to load. Waterfalls are a great way to diagnose what's slowing down your web pages. You can access these waterfalls by measuring the performance of your actual users (Real User Monitoring) or simulating traffic (Synthetic Monitoring). There are two types of performance waterfalls we measure in our Real User and Synthetic Monitoring offerings. Every file on a web page is served up by a domain. So by grouping the performance waterfall by domain, you can scan for issues more quickly than if you were looking at each file individually. 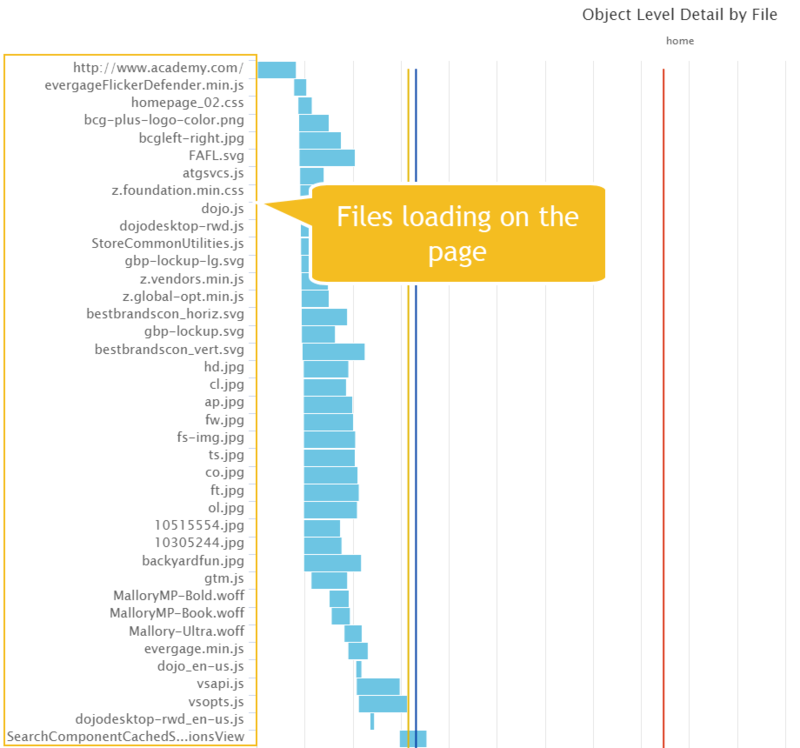 For example, the google-analytics.com domain in the chart below is serving up the analytics.js and ec.js files. This waterfall displays every single file on the page. After you scan the domain performance waterfall for issues, drill into the specifics with this chart. 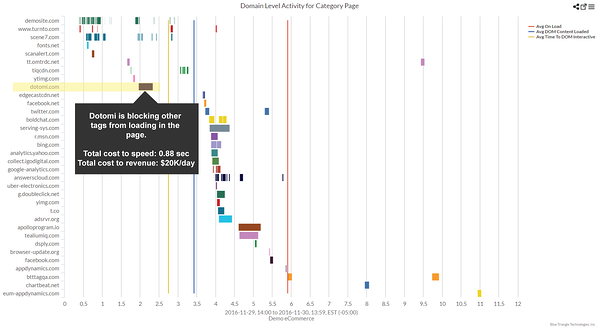 Those blue, yellow and red vertical lines denote key milestones in the life of the page load – the DOM Interactive, DOM Content Loaded and Onload (Page Load Time). What it is: The moment users can begin interacting with the page. The browser has finished parsing all the HTML and DOM construction is complete. What it is: The initial HTML is loaded and parsed. External resources like stylesheets, images and subframes may still be loading. What it is: The page is fully loaded and the browser's icon stops spinning. Content can load in the page after this event (i.e. analytics, session replay, live chat). Why it's important: Many folks gauge their site's performance based on Onload, or Page Load Time – and for good reason. Users can easily notice when the page is fully loaded because they are able to interact with all of it (and the browser's icon stops spinning). Make sure it's fast! If a file in the waterfall is loading slowly, it will be thicker than the rest. Use this information to ensure vendors are fulfilling their SLAs. Be sure to remove files that aren't needed on the page. When third party tags are added to your site, there is always a risk that they are loaded long before they need to. For example - you probably don't need to load footer images or analytics technology before the DOM Interactive since they are not necessary for the page's initial load. That's why it's important to establish good third party tag governance. Quickly see the length of time it takes for your users to interact with the page (DOM Interactive), load the initial HTML (DOM Content Loaded) or fully load the page (Onload). Most monitoring services offer these waterfalls, but they are generated from just 1 session or measurement at once. This means you need to look at multiple performance waterfalls to see if a problem file is actually a problem. Blue Triangle's waterfalls are aggregated from hundreds or even thousands of sessions at a time. You'll find website issues in your waterfall and have to prioritize them. Blue Triangle is the only company that can predict the impact specific changes have on revenue. I hope this Performance Insider blog post was helpful for you. Should you have any questions, comments or concerns, please send me an email: josh@bluetriangletech.com.